Here are where the strings are tethered at the bridge end of the sitar, it doesn't look as daunting as I first thought - but nevertheless. I can't see any way of mounting the headstock string guides, other than re-stringing? Hi Kr236...Looks like a decent sitar. It helps a lot that you posted some pictures. or "swan" and that is the bead or fine tuner for your F#. There should be another bead on the next string that is usually round and that is the C#. The other beads in your plastic bag are for the next two strings which are tuned G# and low C#. You will probably be able to get close to the correct pitch without the last two. I have seen sitars that omit these. It just depends on how good your pegs are, but I think that it is crucial to have the fine tuners. 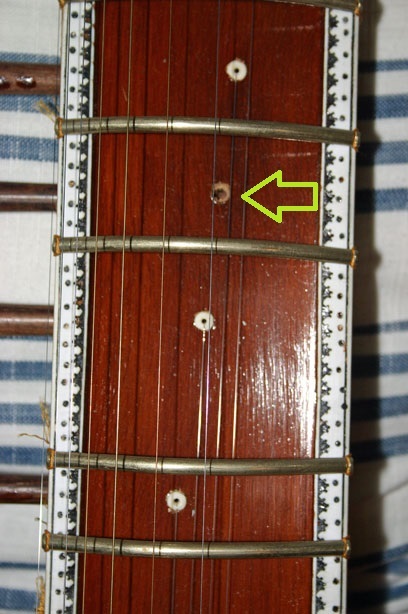 The "unidentified" bead could be your C#-"SA" fine tuning bead for the second string if that one is missing. I cannot tell for sure. Ok, update, yes your SA is missing a bead. Good luck. Persevere and you shall play the sitar;-). 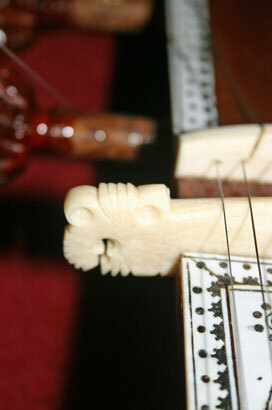 Here is a picture showing the egg-shaped tuner beside the swan. And here the fine tuners at the headstock. What is the comb-shaped extension please? So, I have no option but to re-string, in order to fit the fine tuners? "So, I have no option but to re-string, in order to fit the fine tuners?" But, playing is more important. 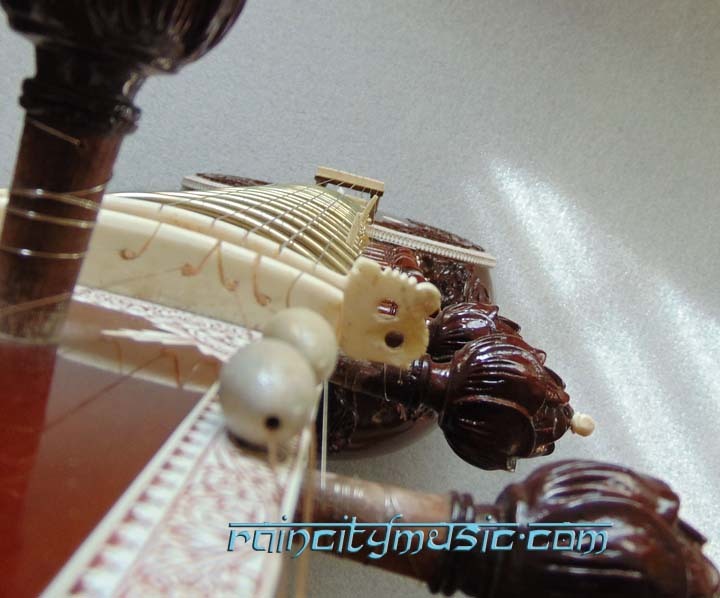 sound by fine tuning the various parameters of the instrument; fine tuning beads, new strings, tuning the frets etc. Thank you. 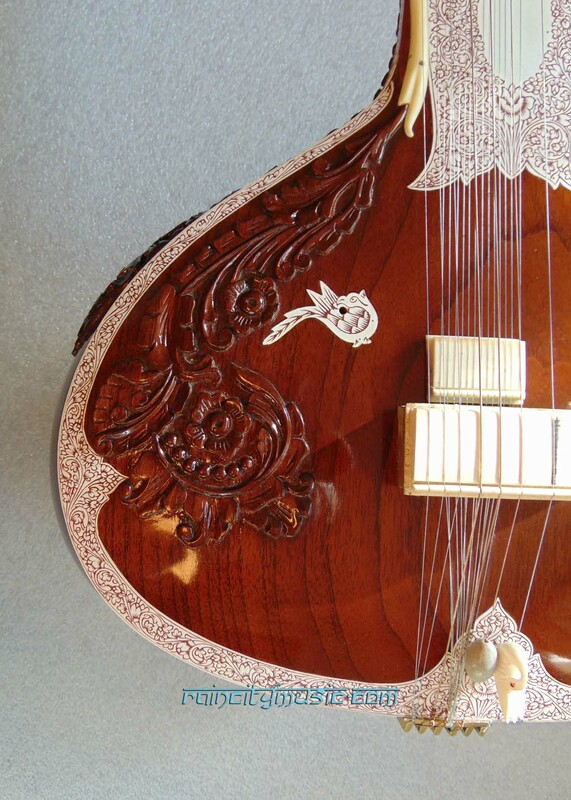 Am relieved the sitar is in such good shape, although I carefully stored it. What is this extension please, it seems to serve no function. Is it there to store spare strings? time with him and I would consider him a friend even though I don't see him very often. He has stayed at my house and I have cooked him dinner and I even think he kind of fancied my cute niece. Years ago I did his 10 day yoga teachers training "intensive" and everybody is there on the first day sitting around doing poses and chatting, waiting for Eric to show up and finally he did. As far as that funny thing on the side of your sitar I've got one too but I have never been able to get a sound out of it;-). Low Sa / C# question. 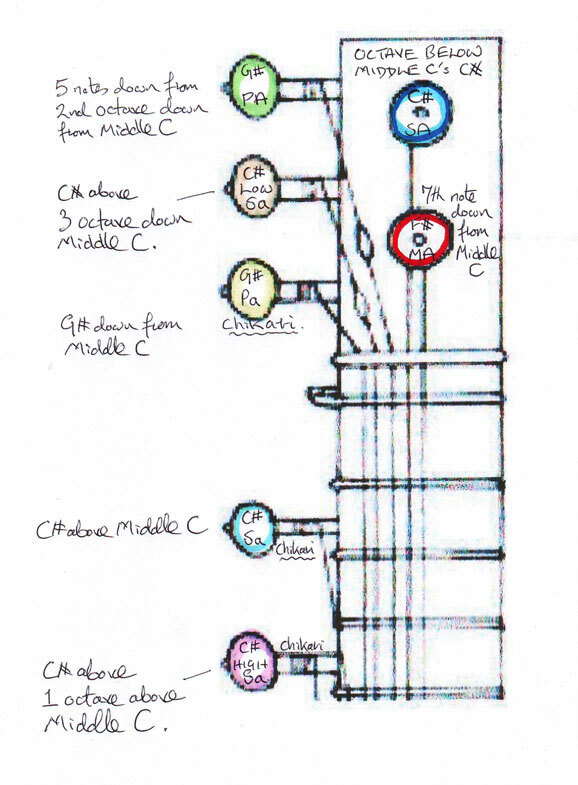 Here is my tuning diagram, have I got it right please? Have noticed that the Low Sa string is incredibly lax, am wondering if the sitar has the wrong string in this position please? don't stress it too much. Keep going. MMM Seems like you've put the second SA string on TWICE here. It's easy to see it's wrong without actually needing to listen to it??!!?? Which would be the correct string please? I was sure it was the wrong gauge because it also rattles slightly; I am more than willing to replace it, it will give me the excuse to fit one of the ceramic fine adjusters. 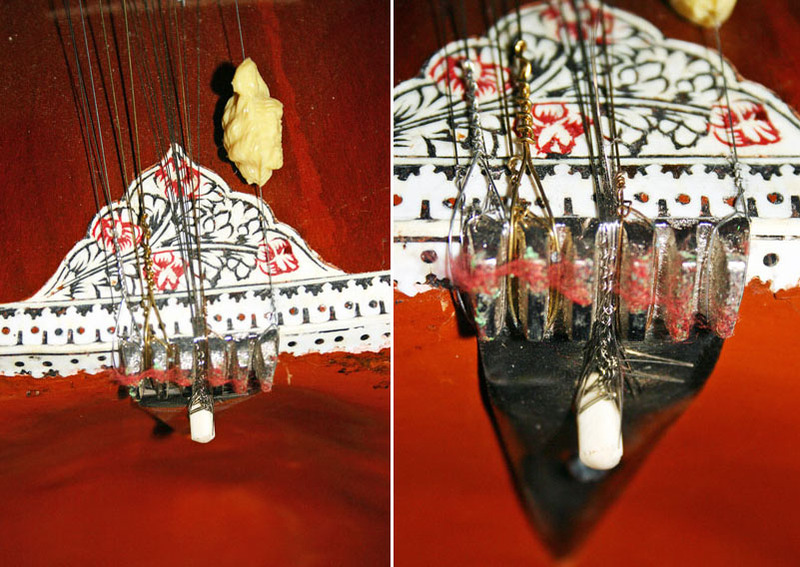 Nick, I haven't put any strings on any thing - this is how the sitar was set up. The first string-Ma, should be .012 steel string and the second string-Sa, should be .016 bronze.